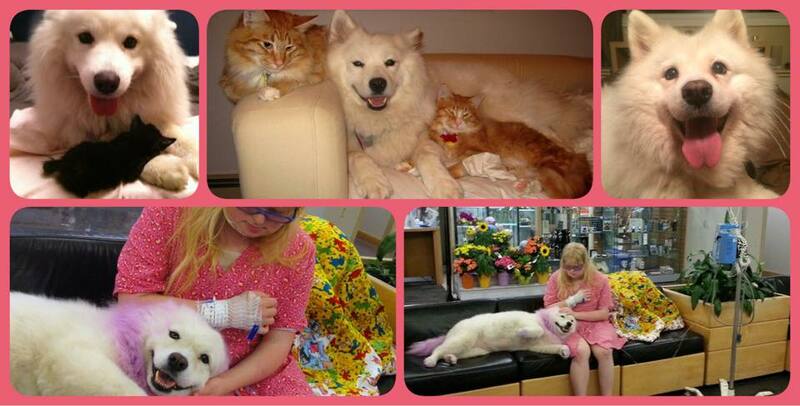 Thank you for taking the time to read about our special girl Sasha. every contribution helps us cover the enormous cost of her much needed surgery. Please note it is for "Sasha Corbett" on the memo line. and added as "offline donations" to the GoFundMe page, so the running total will be up to date. Sasha is a beautiful spirited Samoyed that came into my rescue, Carried Through Animal Rescue, 5 years ago. She is not currently in rescue, or available for adoption - but she is our rescue alumni. Though we followed up with a few homes for her, they all fell through for one reason or another. I quickly knew why - it was fate - Sasha was my "heart dog" - my soul mate dog. This girl bring so much happiness to me, and everyone she meets. She passed her Pets and Friends testing and qualified as a therapy dog! She loves all the dogs that come through our rescue, and mothers all the kittens. She very quickly because "the face of CTARE," and in addition to helping me "care for" all the rescue animals, she taught people how amazing a rescue dog can be. We (myself, our vet, and other animal care professionals) guessed Sasha to be 2-3 years old at her time of adoption by me. She had a bit of a funny walk, but never would never show pain, so we had assumed she was tethered or otherwise restricted in her short life (we knew NOTHING of her life before our rescue, she was a stray that was found with no hair, etc). This last year Sasha has started limping, and after doing some extensive vetting and testing, we came to the conclusion that this poor girl likely suffered a hard trauma at an early age that caused her hips to go much earlier than, say, an average dog with hip dysplasia or arthritis. Our regular vet suggested a visit to Canada West Specialists, and once there, they confirmed Sasha was indeed a candidate for a newer hip replacement surgery that would "make her feel like a puppy again". This was really exciting, considering that Sasha has never walked "normal" - we cannot wait to see what the outcome of the surgery does for her. We think Sasha is currently 6-8 years old, and Samoyed dogs typically live for 12-15 years. Because Sasha had existing hip issues from the day of her rescue, she could not qualify for pet insurance coverage, therefore, the entire cost of the surgery falls on us. How do we help her? Sasha had her first hip replacement in June 2014 and it was successful. We are now raising funds to help cover the cost of the second surgery (surgeries are just under $8000 each). For now we are medicating with an NSAID pain reliever (Meloxicam, generic Metacam) and lubricating with many expensive joint supplements. However, this runs the risk for any dog of stomach ulcers and other complications within as little as one year, so it is not a feasible way to keep helping Sasha with her hip problem. She would also like lose most mobility within a few years, and be very restricted on how long she could walk for etc. Previously, a surgery called FHO was used to help dogs in this circumstance. In an FHO, vets remove a dogs femoral head joint, thus giving them a full range of motion, free of pain. However, this surgery is not as successful in dogs over 50 lbs, and would immediately limit Sasha to very short walks for the rest of her life. In most cases, FHO would be performed on older dogs with advanced arthritis, who were more suited to a less active lifestyle. FHO surgery is around $5000. Total Hip Replacement is a new surgery that is really amazing. It has a 95% success rate, and the worst case scenario in the very small chance that your dogs gets an infection, is that they revert the surgery to an FHO. Total Hip Replacement is done at 2 separate times, on one hip each time. 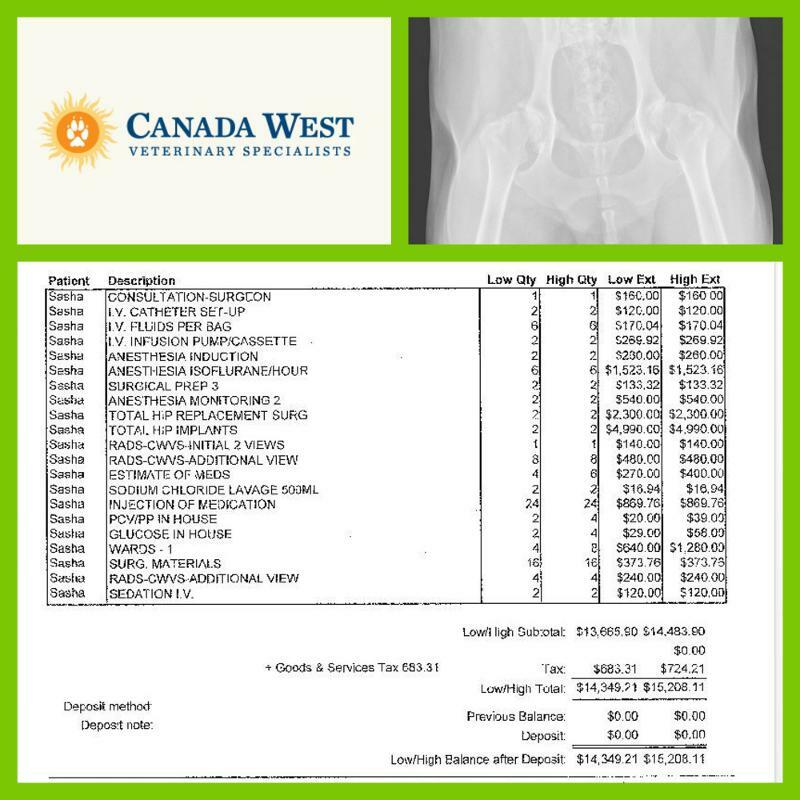 The vet quote below, for over $7000, is for ONE hip. Where and When is this done? Sasha had her first hip replacement in June 2014, and will have her second May/June 2015, at Canada West Veterinary Specialists. You can read about Hip Replacement on an old blog article from Canada West by clicking here. Why should we contribute to this cause? Although Sasha is not currently a rescue dog, she is our rescue alumni. Its hard to save such a large amount of money for one surgery for her, when we often have 5-10 other dogs we are vetting on a monthly basis. Unfortunately, Sasha could never qualify for pet insurance, and for this reason we are calling on dog lovers to help us help Sasha. Sasha celebrates her 5th "Birthday" with us April 21, 2015. What a GREAT birthday present this could be for our sweet girl! 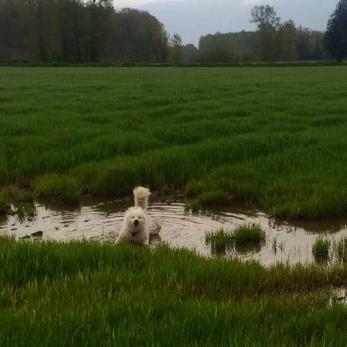 Of course, Sasha's favorite part of her birthday is playing in random mud puddles and getting as dirty as possible! 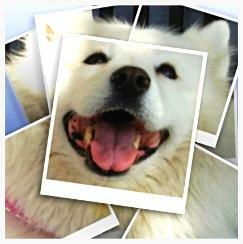 Visit Sasha the Samoyed on Facebook for Updates!